So, I broke my ankle back in October, and after surgery and as a result, work and parenting has sucked up pretty much all of my time. And the geosonnet backlog has finally run its course. 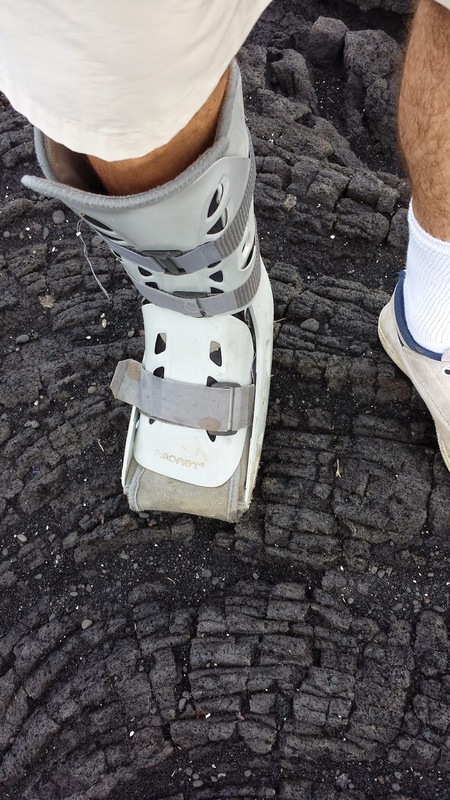 Also, although the "moon boot" is marketed as bing for walking, it doesn't seem to be particularly good for walking on lava. I'm guessing it was designed by a non-geologist. While on the Earth it is but a trace gas. The stable carbonates, which won’t degas. In torrid climates, weathering is fast. Can be deduced with XRF and brains. An early Permian heats up and thaws. Digesting rocks chewed up by glacial jaws. But not enough for ice to grow anew. No evidence what long ago escaped. The clinopyroxene preserves the S.
While clean eruptions let life persevere. ‘till early algae terraformed the Earth. One grand event, replacing gasses toxic? Or did O oscillate since life’s first birth? Did evolution make fate manifest? Inexorable progress of the gene? Or was the early oxygen repressed? These visions of our past yearn to be fact. Lest ancient rocks reveal what’s causable. Archean soil lets us know the way. Oxygen came, but then it went away.